The World Rugby Museum was recently contacted by a man who, in the 1950s, helped to implement the DEW Line system in northern Canada. The DEW Line, short for Distant Early Warning Line, was a Cold-War system of radar detection stations set up in the Arctic region to provide early warning in the event of an air invasion. I had just turned 22 when I found myself on Saturday 26th May 1956 in a beaten up DC4 ( Mercury flight) flying north to the DEW line destination Fox Base on the eastern shore of Melville peninsula 68º45’N 81º13W ( now known as Hall beach). I arrived at 02:30 in blazing sunshine and very cold. 3 weeks later on Wednesday 20th of June I was transferred to FROT* (Frobisher Bay at the head of the bay of the same name on Baffin Island now Iqaluit). Here I met Keith Lay, an Englishman who had founded and started Arctic Rugby a couple of weeks earlier. Also a Law student Bob Barr, who became a great friend. I first played in the third game on Saturday 23rd of June, as part of a ‘coloured-strip’ verses ‘white-strip’ on the rough open space between the huts and mess hall. We carried on like this every week with standards steadily improving and teams changing as people came and went out to sites. Keith was working an 84 hour week so he asked me to take over the simple matter of organising games and to keep Arctic Rugby going that short summer ( I only worked a 65 hour week). 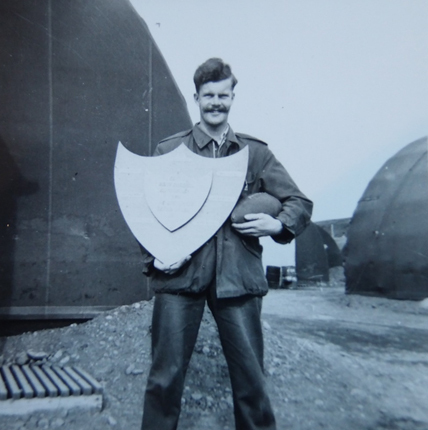 By mid-July two 10 a-side teams became established, the Barbarians captain Keith Lay made up mainly of us immigrants and the frustrated Fusiliers captained by Bob Barr with the Canadian players. Competition hotted up and the standard improved with each game we had three referees, Captain Gallager, Paddy Murphy and Bob Aiton. Going into August I was aware of murmurings from the Canadian team who thought that just playing the same friendly each Saturday was getting a bit pointless so we decided to change the format and get really competitive. 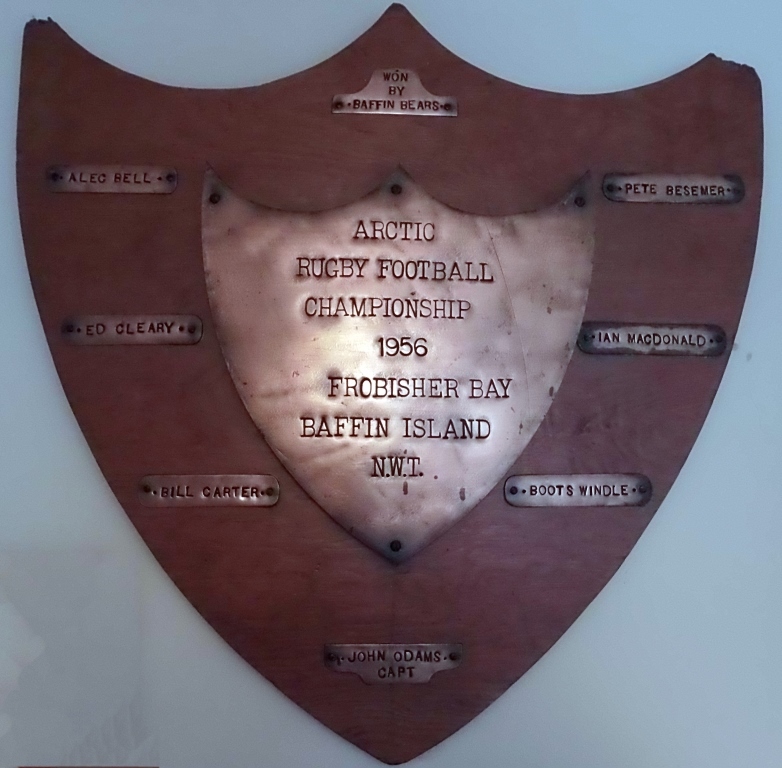 A three-team 7-aside Arctic Rugby Championship was inaugurated, Keith Lay’s Barbarians and Bob Barr’s Frustrated Fusiliers became 7-aside teams and I captained the third, the Baffin Bears. Rivalry became fierce. The championship was held in early September of 1956, it started to snow in the middle of that month and six games were played in all. The Barbarians looked strongest on paper but the Frustrated Fusiliers were all fired up for national honour. I arranged a bonus points system so that a three way tie would be unlikely. Both the Barbarians and Fusiliers had to make team changes, because of injury and non-availability.The final game would be contested by the Fusiliers and the Baffin Bears with the Fusiliers needing only need a draw to win. The Baffin Bears had to win and did, man of the match was ‘Boots’ Windle with a try saving tackle on Terry Mcnally and scoring the only try. At FROT base was a USAF contingent and these Yanks watched our games thinking us mad to play on ‘concrete’. One American serviceman Booker Thompson, asked to play, we put him on the wing for his first and only game, a very nice guy, he was tackled, concussed and left horizontal. The Yanks then knew we were all mad. A Championship shield was made in the workshop 24” x 24” now on my study wall and 24 beer mugs ordered to be engraved in Montreal and sent north by Bob Barr when he returned to college following the last game. I sent the shield home from the Arctic by letter post (Canadian efficiency). We all enjoyed a great deal of fun from playing that summer and I ask has another Rugby Championship ever been played in the Arctic? This entry was posted in Canada, Clubs. Bookmark the permalink.